ಯುರೋಪಿನ ಒಕ್ಕೂಟ (ಆಂಗ್ಲ:European Union - EU) ಯುರೋಪ್ ಖಂಡದಲ್ಲಿರುವ ೨೫ ಗಣತಂತ್ರ ದೇಶಗಳ ರಾಜಕೀಯ ಒಕ್ಕೂಟ. ೧೯೯೨ರ ಮಾಸ್ಟ್ರಿಚ್ ಒಪ್ಪಂದದ ಕೆಳಗಡೆ ಸ್ಥಾಪಿತ ಇದು ಪ್ರಪಂಚದ ಅತೀ ದೊಡ್ಡ ಸ್ವತಂತ್ರ ರಾಷ್ಟ್ರಗಳ ಒಕ್ಕೂಟ. ↑ Not de jure - Brussels is unofficialy referred to as The Capital of the European Union because it is the hub of EU institutions: it hosts the European Commission, the European Council, and the European Parliament. ↑ ೫.೦ ೫.೧ ೫.೨ If counted as a single unit. ↑ ೬.೦ ೬.೧ Total: According to IMF Estimations & Reports for 2005; Per capita: According to the CIA World Factbook . ↑ Estimated using members' HDI, and weighted by estimated current population. ↑ Would be 9th if member states were not counted. 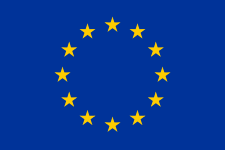 ↑ Plans for a EU-wide +3 prefix were abandoned. The European Telephony Numbering Space, +388 3 is somewhat similar. Current members' codes begin with either +3 or +4.